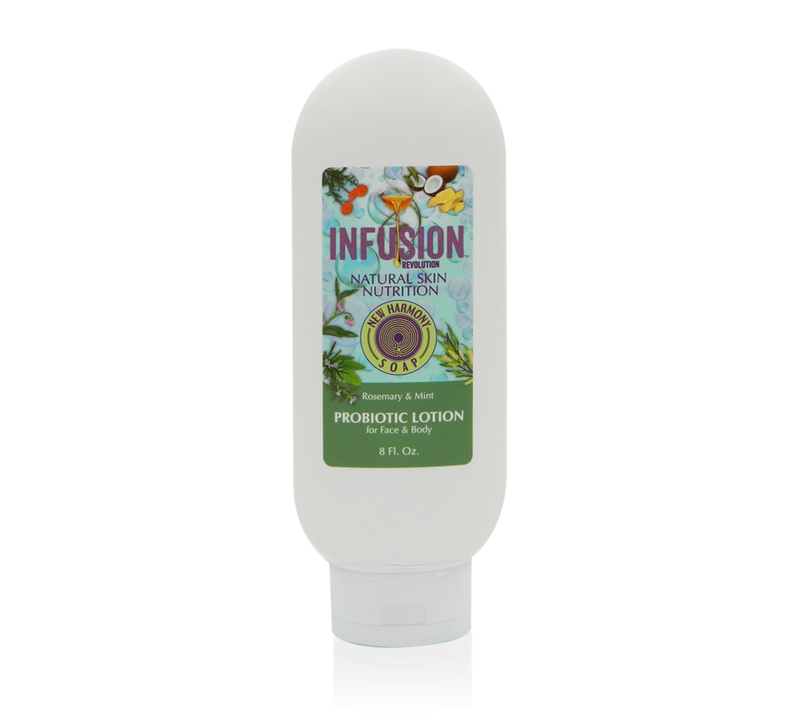 Our premium, all-natural Rosemary and Peppermint scented Probiotic lotion is fast becoming a year-round staple in bathrooms across America due to its exceptional skin softening and youth-protecting properties. We never use skin-drying alcohols. No water. No waxes. No parabens or synthetics. Our high-performance Probiotic lotion moisturizes and softens without leaving oily residue. Within minutes you can actually feel your skin re-hydrating. Try it and you’ll be hooked! Research is also showing that topically applied probiotics provides relief and improvement for people struggling with Rosacea, Acne, Eczema, and Psoriasis. Read our recent article to learn more. Our lotion starts with a blend of Organic Aloe Vera Juice, Avocado Oil, and plant-derived Glycerin and then its skin nutrition factor is pumped up with a group of complexion revitalizing probiotics and full-spectrum Vitamin E. We’ve worked with our customers for more than a year to develop an all-natural lotion that delivers noticeable, lasting results. The rosemary essential oil in this lotion is grown and distilled in Morocco. The peppermint comes from Washington state (USA). Ingredients: Organic Aloe Vera Juice, Avocado Oil, Plant-derived Glycerin, Sodium Lactate, Vegetable-derived emulsifiers, Probiotics, Lavender Essential Oil, Full-spectrum Vitamin E.